The 416 Fire burned more than 1,000 acres in nine hours Friday north of Durango. Erratic winds were a challenge for firefighters who were trying to keep the blaze on the west side of U.S. Highway 550, which was closed to traffic. Up to 15 aircraft were fighting the fire. 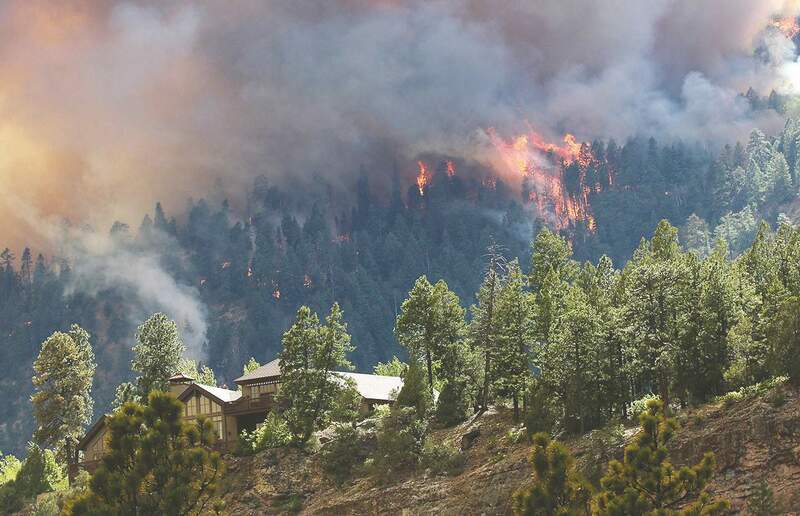 About 825 homes were evacuated and 760 more were placed on pre-evacuation notice Friday about 10 miles north of Durango where a fast-moving wildfire consumed more than 1,100 acres in nine hours. The 416 Fire was reported about 10 a.m. near the Iron Gate subdivision and quickly put up a column of smoke that was visible from downtown Durango and other parts of La Plata County. By Friday afternoon, the column of smoke had grown so massive that fire officials were concerned it would collapse onto itself and spread ashes onto the east side of U.S. Highway 550, where most of the homes are located. Smoke drifted more than 60 miles to the northeast, past Pagosa Springs. No structures had burned as of Friday night, and no homes were in immediate danger, said Scot Davis, spokesman for the San Juan National Forest. The Colorado Department of Transportation closed Highway 550 about 1 p.m. Friday, and it remained closed overnight. The closure will be re-evaluated Saturday, said CDOT spokeswoman Lisa Schwantes. Firefighters planned to monitor the blaze Friday night and hit it again Saturday morning with aircraft. Residents in the vicinity of the fire are urged to be on high alert. County Manager Joanne Spina proclaimed a “state of local disaster” Friday night for the unincorporated parts of La Plata County. The declaration activates emergency plans and authorizes the use of funds under those plans. Spina will recommend county commissioners extend the declaration for seven days or more. The Durango & Silverton Narrow Gauge Railroad said it will cancel Saturday train operations as a result of the severe fire danger. Early scanner reports said the fire started near the train tracks, but no official cause has been released. Train passengers who were in Silverton had to be picked up by buses Friday night. But because Highway 550 was closed, the buses had to take a 177-mile trip from Durango, to Mancos, to Dolores, to Ridgway, to Ouray and finally to Silverton. Erratic winds pushed the fire in unpredictable directions, said Butch Knowlton, director of La Plata County’s Office of Emergency Management. 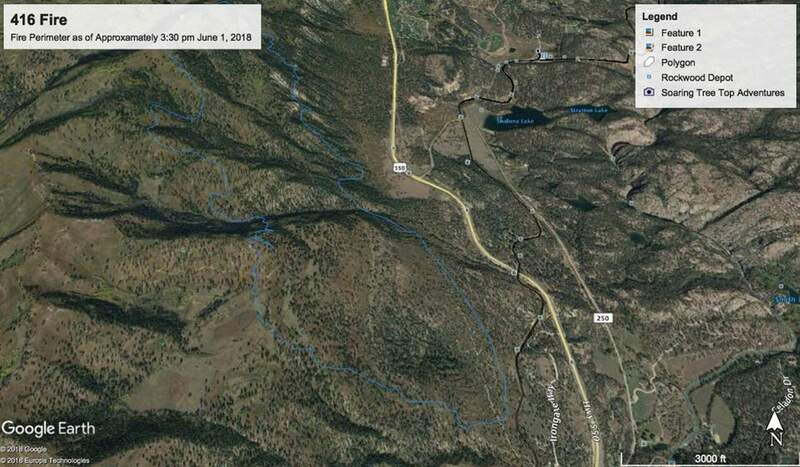 The primary objective Friday was to keep the fire on the west side of Highway 550 near Shalona Hill, away from several hundred homes on the east side of the highway, including subdivisions near Shalona, Rockwood, Tamarron, Glacier Club and Electra Lake. At least one small spot fire crossed the highway, but it was extinguished, Davis said. Spot fires occur when embers fly out of the main body of the fire and start new fires. The fire remained on the west side of the highway Friday night. Residents from Bakers Bridge at County Road 250 north to Electra Lake Road were under mandatory evacuation orders. Residents from north Electra Lake to Meadow View Drive were under pre-evacuation notice. That includes Purgatory, Durango Mountain Resort, Cascade Village, Celadon, Red Tail Mountain Ranch and Elkhorn Mountain subdivisions. An evacuation center was opened at Escalante Middle School, 141 Baker Lane in Durango; and a second evacuation site was to open at the Silverton School, 1160 Snowden St., in Silverton. Durango Fire Protection District initially responded to the fire, but a federal team took over command Friday afternoon. A Type II team was expected to be assigned to the fire Saturday. Up to 15 aircraft were working the blaze Friday, including helicopters and air tankers. Federal and local fire officials reminded residents it is illegal to fly drones near the fire area. At least one drone was seen flying near the south end of the fire, and the La Plata County Sheriff’s Office was sent to try to contact the pilot. “We have got to get the drones out of the air,” Davis said. La Plata County and federal land agencies entered Stage 2 fire restrictions Friday, which prohibits campfires, even in developed campgrounds and recreation areas. By Friday night, the huge column of smoke that towered over the north Animas Valley settled down and was expected to fill the Animas Valley and many other valleys across the region. San Juan Basin Public Health advised that smoke in the air is particularly dangerous for the very young, elderly or people with heart and lung conditions. People who are concerned should stay inside and reduce outside physical exertion. People for the Ethical Treatment of Animals, or PETA, also advised that residents in areas affected by smoke and ash should keep their animals indoors and avoid outdoor activities, such as running with dogs. Herald Staff Writers Shane Benjamin, Maria Carrasco, Claudia Laws, Amy Maestas, Alex Semadeni, Mary Shinn and Ryan Simonovich contributed to this report. Evacuated areasIron Gate subdivisionElectra Lake areaChris ParkHaviland LakeBetween Bakers Bridge and Electra Lake RoadGlacier ClubTamarron subdivisionOn pre-evacuation noticeNorth Electra Lake to Meadow View Drive Purgatory and Durango Mountain Resort Cascade VillageTail Mountain Ranch subdivisionCeladon subdivision Elkhorn Mountain subdivision ClosuresU.S. Highway 550 is closed until Saturday morning, the situation will be re-evaluated at that time.Purgatory is closed for Saturday activities.Durango & Silverton Narrow Gauge Railroad operations are closed Saturday.Community resourcesLa Plata County government hotline for residents evacuating: (970) 385-8700.Livestock can be evacuated to La Plata County Fairgrounds, 2500 Main Ave.Four Corners Back Country Horsemen will assist with horse and livestock evacuations, call (570) 228-1340.Small animals can be evacuated to La Plata County Humane Society, 111 South Camino del Rio.Donations of clothing and household items accepted at Discover Goodwill of Durango, 1230 Escalante Drive.Financial donations can be made to the Community Emergency Relief Fund by calling (970) 375-5807.Tips for pre-evacuationFor people who received a pre-evacuation notice, these steps can improve their safety and expedite departure should an evacuation become necessary.